The Social History collection contains numerous objects relating to late 20th century popular culture, from 7” singles and CDs to t-shirts and paper ephemera. 20 years ago today, US band Nirvana were due to play at the Aston Villa Centre in Birmingham (30 March 1994). The concert would follow on from the success of their albums Bleach, Nevermind and In Utero, representing a shift in musical style and an aesthetic that downplayed many of the conventions associated with mainstream rock music. Nirvana had played in Birmingham before, in 1989 and in 1991. 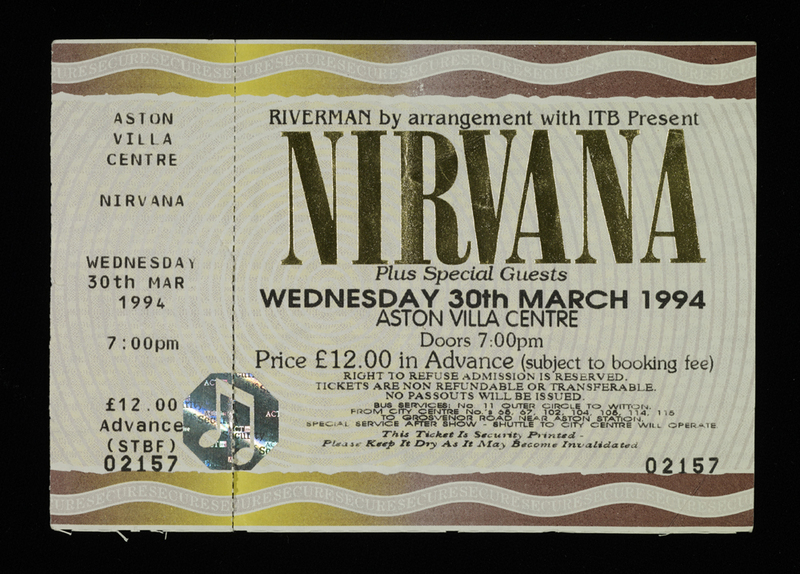 The fan who donated this ticket planned to travel to Birmingham from his home town over 200 miles away to see Nirvana for the first time. His ticket remained intact and unused as the concert was postponed following concerns over the health of Nirvana’s lead singer, Kurt Cobain. His suicide on 5 April 1994 meant that a concert at the Aston Villa Centre would never take place.